Today's victim wanted a proverb, "Out of Sight, Out of Mind", tattooed in Hebrew on his arm. This alone is strange enough, the arm is not that far from the eye, after all. 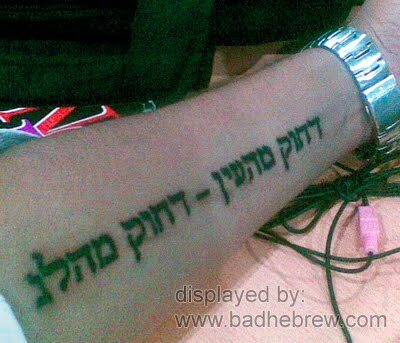 This lovely Hebrew tattoo, which was sent to us by Michelle, encountered several transcribing misfortunes. Eventually it mutated into a slightly misspelled "Squeezed from the eye - Squeezed from Helen". One of the funniest misspellings seen so far! You'd say that it looks just the same? It is not. Hebrew is all about the subtleties. In Hebrew, the word for "far" is "Rachok", it is written with a Resh. Exchange the Resh for a Dalet and you get "Dachuk" which means squeezed or pushed away. Now, "from the heart" in Hebrew is "mehalev". Switch the Bet (here pronounced as V) for a Nun, and you get "mehelen" - from Helen. It's a misspelled Helen, since Nun should be used in its final form when it closes a word, not the regular form we have here. Typo, you are correct: this one is fixable, and not as bad as some previous victims who, 'out of their minds', should have chosen a location 'out of sight' for their scribblings. To be fair, the final letter appears to be a gimel, not a non-sofit nun. Well, perhaps that's worse. It's actually a Gimel, not a Nun - which makes it funnier in Hebrew/English because the last part reads: "Far from the LEG"
lol non-sofit sounds like nun-sofit.